There’s nothing better than the first splashes of colour that spring brings with it – all those daffodil yellow and crocus purples. But why leave the bright colour to nature? Bin the everyday reds or French polish and bring out the peaches, hot pinks and minty greens. Yes, it may be a little bold but why not? Spring only comes around once a year. 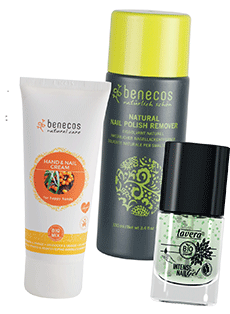 To keep your nature-inspired colours natural, opt for Benecos nail varnish. It’s free from six harmful and toxic chemicals which may be present in conventional high street brands such as TPHP, camphor, colophony, formaldehyde, phthalates and resin, so your hands and nails remain naturally beautiful. Go bright with Oh LaLa! a hot raspberry pink shade that will gleam in the sun. Or bring out the pastels with Peach Sorbet, a creamy shade that will make your nails look good enough to eat. Or the bravest polishers might prefer Minty Day, the coolest Benecos shade on the block. 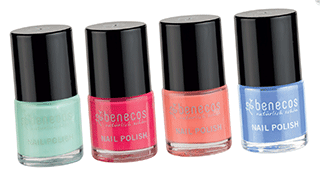 And of course you’ll need some Benecos Natural Nail Polish Remover for when you decide to hop, skip and jump over to your next spring colour. Don’t forget to keep your hands beautifully soft with a natural hand cream. We love the Benecos Hand and Cuticle Cream as it nourishes the hands and softens the cuticles while protecting from the elements. Or why not try the Lavera Intense Nail Gel to strengthen, hydrate and enhance your nails. The organic and natural formula contains extracts of pineapple, coconut and aloe vera.